Experience the warm nostalgia of a glowing electron, vacuum tube. 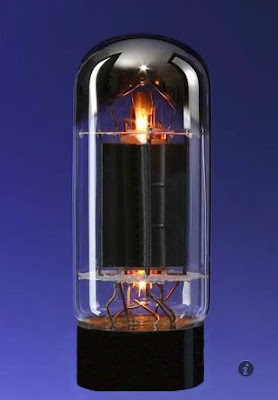 Used in radios and televisions before semiconductors made their appearance, vacuum tubes are enjoying a huge resurgence in high-end audiophile devices. You can carry your very own vacuum tube powered by the battery in your iPod Touch or iPhone. Touch to apply filament voltage. Let the soft glow of the electrons transport you back to the mellow days of analog transconductance. Touch again to power down.